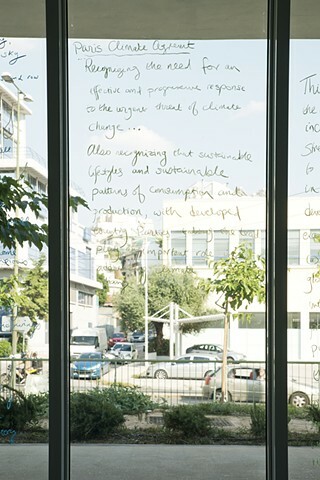 At the invitation of the Athen's Mayor's Office at the Serafio Sports Culture & Innovation Center, Athens, Greece. Exhibition dates: July 5-18, 2019. Statement: The City of Athens partners with Monica Jahan Bose and the DC Commission on the Arts and Humanities to present Footprint-Apotýpoma, a site-specific exhibition that brings together saris, printmaking, writing, video, community workshops, dialogue, and performance by Washington DC-based artist and environmental activist Monica Jahan Bose, as part of her ongoing feminist collaborative project Storytelling with Saris. 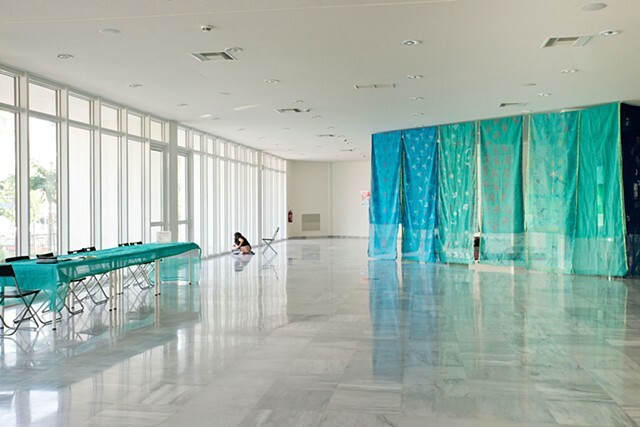 In addition to the exhibition, Bose will organize workshops and performances with refugee women and the general public. Born in the UK to Bangladeshi parents, Bose is a US immigrant who has lived in seven countries. Her work is informed by displacement. This is her first exhibition in Greece. Footprint-Apotýpoma speaks to climate change, conflict, migration, and displacement. “Footprint” refers to carbon footprint as well as the miles traveled by migrants and refugees. The Greek word “apotýpoma” is also used for printmaking and fingerprinting (e.g., at border controls). 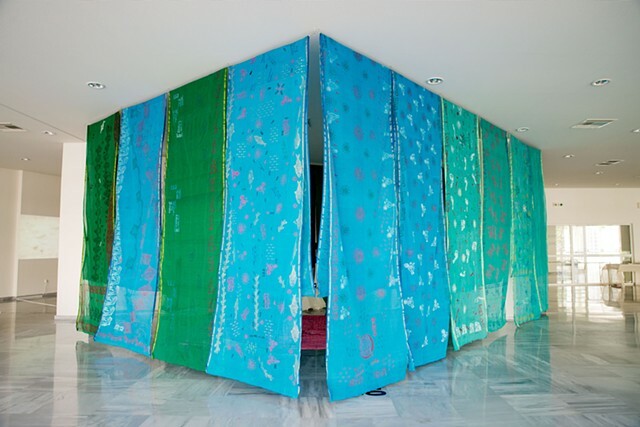 Bose utilizes saris from Bangladesh to create an interior space or dwelling within the gallery, alluding to the homes that are being destroyed by extreme climate events and the shelter that will need to be provided for those displaced by climate change and conflict. 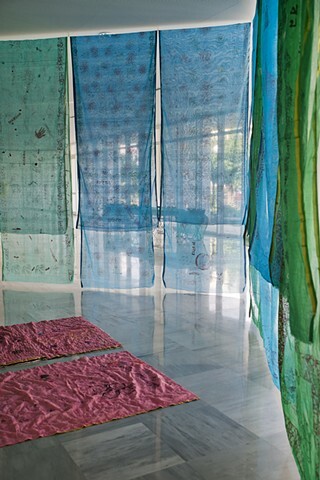 The saris are covered in woodblock printing from Bangladesh and handwritten promises made by Americans and Europeans to reduce their carbon footprint. Bose’s printmaking on paper uses words and imagery to speak to the disruption of nature caused by climate change. 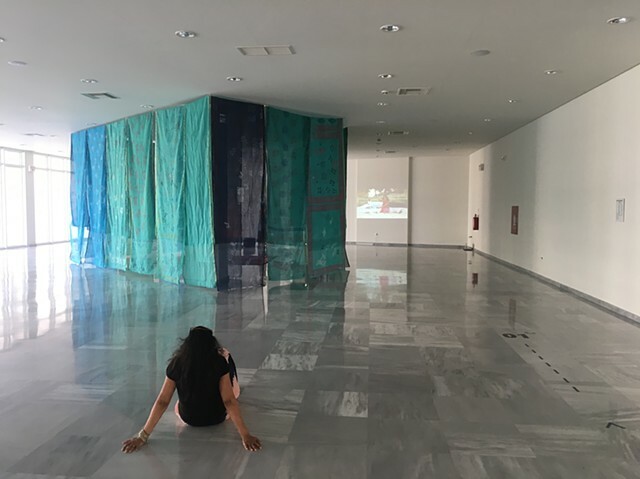 Over several years, she has collaborated with the women of her ancestral village, Katakhali Village, Barobaishdia Island, Bangladesh, and well as with women in Washington, Miami, Honolulu, Paris, and now Athens. 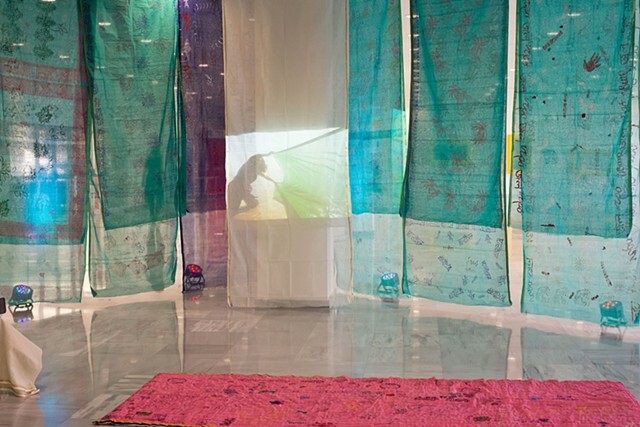 Bose’s performances, videos, works on paper, and saris explore themes of empowerment, environment, mythology, and community. 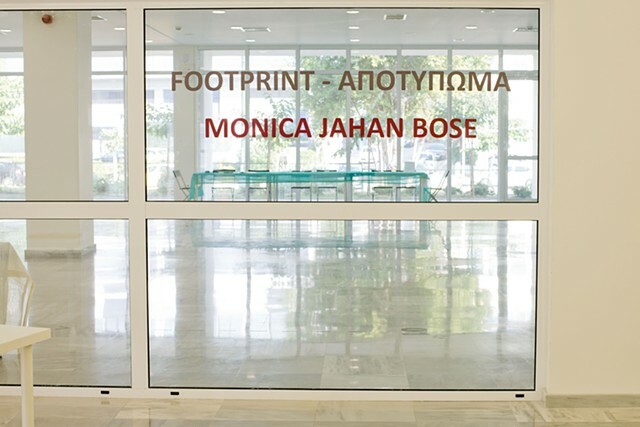 Bose uses text in Bengali and other languages and women’s writing as integral elements in her work, highlighting multilingualism and women’s agency and literacy. 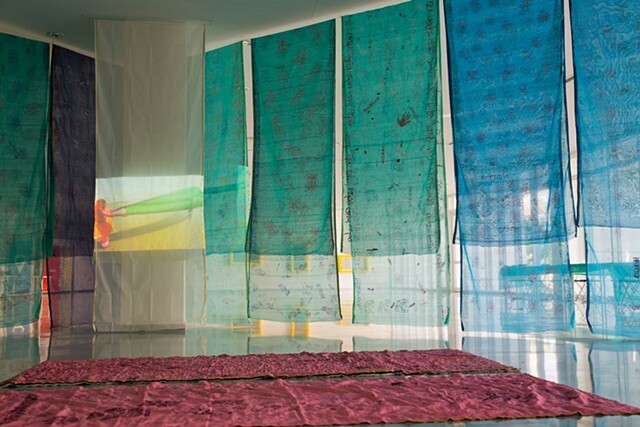 She uses the sari — 6 meters of unstitched handwoven fabric — to represent women’s lives and the cycle of life on our planet.